On 25 February 2007 at 02:15 GMT, Rosetta passed just 250 km from the surface of Mars. Rosetta’s Philae lander took this image 4 minutes before closest approach, at a distance of 1000 km. It captures one of Rosetta’s 14 m-long solar wings, set against the northern hemisphere of Mars, where details in the Mawrth Vallis region can be seen. Mawrth Vallis is of particular interest to scientists because it contains minerals formed in the presence of water – a discovery made by ESA’s Mars Express. This image was originally published in 2007 and was taken in black-and-white. Representative color was added to the surface of Mars and, in this version, these colors have been slightly enhanced, along with some brightening of details in the solar wing. On Sunday 2 March, Rosetta celebrates ten years since launch. 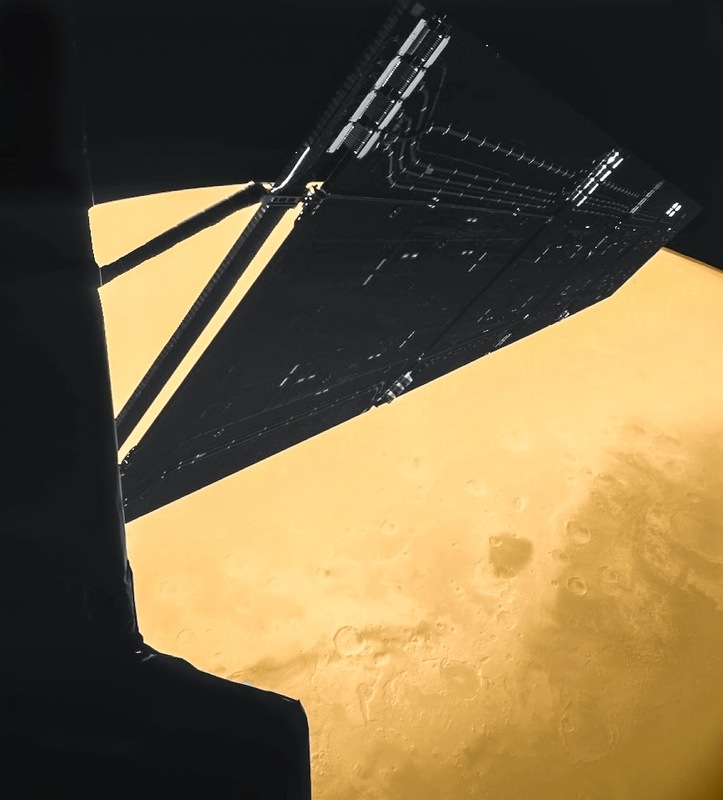 The flyby at Mars was one of four planetary gravity assists (the other three were at Earth) needed to boost the spacecraft onto the correct trajectory to meet up with its target, comet 67P/Churyumov–Gerasimenko, in August 2014. Rosetta will become the first space mission to rendezvous with a comet, the first to attempt a landing, and the first to follow a comet as it swings around the Sun.